LAS VEGAS (KSNV News3LV) – The family of the U.S. Postal Service worker killed in a three-vehicle accident in the northeast valley say they hope the driver who caused the crash faces jail time. Alton Hall III, 62, died when a Nissan Altima driven by Lana Matthews-Rhoden, 62, sped through a stop sign at East Owens Avenue at North Mt. Hood Street and hit the right rear of the Grumman mail truck, according to a Metro news release. The Altima then hit an unoccupied vehicle parked on a driveway. 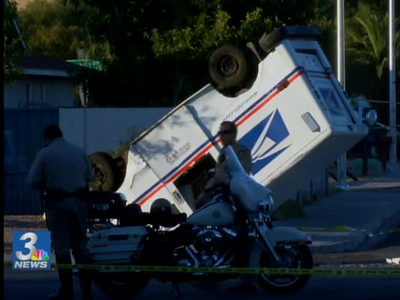 Police say the truck rotated and overturned, ejecting the mail carrier.